India has an ancient history of giving rise to some of the biggest ground-breaking scientific innovations, world’s first surgery being performed by Sushruta in 600 B.C. The legacy has continued and we today are proud of our impeccable advancement in medical field. Surgeons and other medical practitioners in India stand #1 in their respective field. Our hospitals have state-of-art equipment that increase success rate of treatments. Tour2India4Health is a medium to make these immaculate services accessible to patients from any corner of the world. 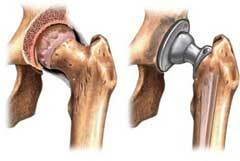 We offer low cost hip replacement surgery at the best hospitals in India. Veteran surgeons: India has a wide array of #1 surgeons, highly experienced with maximum guarantee of 100% positive results. Successful record: Surgery history is not new to India, and we have successfully performed over 1000s of surgeries in the modern times. Low costs: The hip replacement surgery cost and overall medical stay in India is barely 25% of what you may need to incur in western countries. Endless benefits: The benefits of undergoing a surgery in India are endless, with nearly 0% rate of side-effects. Mini vacation: India has a mystic quality of mesmerizing its visitors. 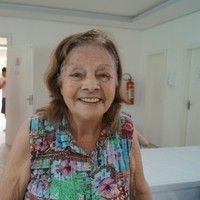 You may wish for your fast treatment and recovery to get back on your feet for a vacation in the world’s #1 country with oldest cultural heritage and history. Hello! I am Mr. Friday from Nigeria. I was suffering from a hip fracture. My brother Uche searched for good options of hip replacement but Nigeria lacked in good doctors and quality medical facilities. Our local doctors recommended Tour2india4health Company in India. We contacted the team and followed the procedure of Tour2india4health Company, and reached India soon after. Tour2India4Health had taken care of the medical visa for me and my brother. I was given the best orthopedic surgery hospital in India. After a stay of additional 3 days I felt good and my hip pain was gone completely. Thanks to the Indian medical team and Tour2india4health for assisting and supporting my total hip replacement surgery in India and making it a success. The modern Hip Replacement (also known as Hip Arthroplasty) was invented in 1962 by Sir John Charnley, The arthritic femoral head (i.e., the femoral head) is removed, and replaced with a metal ball. The ball has a metal stem, which is anchored, into the hollow space inside the femur bone with bone cement. The worn out socket is replaced with a plastic socket. Hip replacement is a surgical procedure in which the hip joint is replaced by a prosthetic implant. Hip pain is caused by osteoarthritis, fracture, rheumatoid arthritis, and aseptic bone necrosis. Sometimes these conditions improve, but there is no cure for joint pain and severe cases cannot always be controlled by medication and rehabilitation. When this happens, some patients have difficulty in walking and the impaired movement hinders everyday activities. These patients sometimes opt for hip replacement surgery. This entails removal of the damaged hip and replacement with prosthesis. The prosthetic hip is usually made of a combination of metal and plastic. Who should consider themselves as a good candidate for Hip Replacement Surgery? Problem in day to day activities like walking, climbing stairs, etc. Who is not a good candidate for Hip Replacement Surgery? Infection from the implant material etc. What are the best hospitals for hip replacement surgery in India? The best hospitals for hip replacement surgery in India offers the cutting edge diagnostic methods and advanced technology supported by the treatment options for the bone related problems. The top hip replacement surgery hospitals in India are located at Mumbai, Pune, New Delhi, Bangalore, Gurgaon, Chennai, Ahmedabad, Hyderabad, Kochi, Goa, Jaipur, Chandigarh, Noida, Nagpur, Kerala, etc. Our hip replacement surgeons in India are highly qualified and have a vast experience in performing the hip replacement surgery. Our collaboration with the highly efficient and experienced team of doctors provides highest quality medical treatments and excellent care to our patients. How is the Diagnosis for Hip Replacement done? A complete history and physical examination allows the physician to determine any correlation between symptoms of pain with past history and demands that have been placed upon the hip. The physician will inquire about experiencing episodes of trauma or instability, and examine the ligaments and hip alignment. 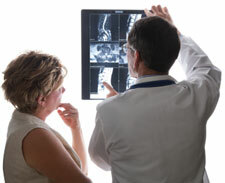 The doctor may also order one or more specialized tests, depending on the known or suspected causes of the pain. Aspiration: Removing a small amount of fluid from the affected hip joint may be required to rule out systemic arthritis (such as Rheumatoid Arthritis) or infection in the hip if there is reason to believe that other conditions are contributing to the degenerative process. Arthrogram: An arthrogram is a special type of x-ray in which a contrast dye is injected into the hip to outline the cavity surrounding the joint. Magnetic Resonance Imaging (MRI): An MRI uses a large magnet, radio waves, and a computer to generate images of the head and back. It is helpful in diagnosing avascular necrosis. Computed Tomography Scan: A CAT scan is another specialized type of x ray that uses computers to generate three-dimensional images of the hip joint. It is most often used to know the severity of avascular necrosis and to obtain a more accurate picture of the joints. Bone Densitometry Test: This test measures the density or strength of the patient's bones. It does not require injections This test is most often given to patients at risk of osteoporosis or other disorders that affect bone density. An orthopaedic surgeon (a physician who specializes in joint and bone problems) will advise you about which treatment is right for you based on your specific case history. Total Hip Replacement surgery has become a common procedure to alleviate pain and debilitation caused by osteoarthritis, rheumatoid arthritis, fractures, dislocations, congenital deformities, and other hip related problems. The immediate benefits of this operation are great. After 4 months, in most uncomplicated cases, a patient is relatively pain-free, has full mobility of the hip, and can walk with a minimal or no limp. In a partial hip replacement surgery, the hip socket is usually left intact. The head of the femur bone is replaced with an artificial component similar to that used in a total hip replacement. Doctors recommend partial replacement in cases where only the femur head is broken or destroyed. Before deciding on partial hip replacement, doctors mау resort to οthеr tactics like pain-alleviating medication, injecting anti-inflammatory agents and steroids, physical therapy and strength training, installing hip braces etc. Bυt іf thеѕе choices fail to give the desired results, then partial replacement mау be the next best remedy left. Hip Resurfacing is a surgical procedure (a form of arthroplasty) which has been developed as an intervention alternative to total hip replacement (THR). 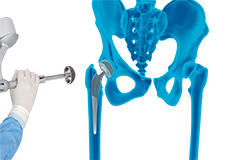 Hip resurfacing is a technique designed to reline rather than replace the worn hip joint. Hip resurfacing creates a bigger hip ball than is generally used in hip replacement, which may reduce the risk of dislocation. Hip resurfacing is intended for younger patients who are not morbidly obese, are clinically qualified for a hip replacement (determined by the doctor), have been diagnosed with non-inflammatory degenerative joint disease, do not have an infection, and are not allergic to the metals used in the implant. Minimally invasive surgery (MIS) is a new technique of hip replacement introduced in 2001. Instead of making one long incision, the surgeon uses two 2-inch (5 cm) incisions or one 3.5-1/2-inch (9 cm) incision. Using newly-designed smaller implements; the surgeon removes the damaged bone and inserts the parts of the new prosthesis. MIS hip replacement takes only an hour and a half; causes less bleeding and the patient can leave the hospital the following day. Double Hip Replacement is a very successful procedure for the treatment of Hip Arthritis recommended to patients who suffer from the degenerative joint condition, Osteoarthritis. The purpose of the surgery is to remove the two damaged and worn parts of the hip joint -the hip socket and the ball (femoral head) - and replace them with smooth, artificial implants called prostheses, which will help make the hip strong, stable, and flexible again. 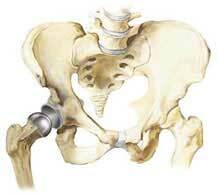 Revision hip replacement surgery is a procedure to replace a worn out hip replacement implant. This means that part or all of your previous hip replacement needs to be revised. This operation varies from very minor adjustments to massive operations replacing significant amounts of bone and hence is difficult to describe in full. Pain is the primary reason for revision. The surgery varies from a simple liner exchange to changing one or all of the components. Extra bone (cadaver bone) may need to be used to make up for any bone loss. Robotic surgery for robotic total hip replacement is one of the most leading surgery techniques in India. With number of advancement in surgery world the surgical procedures are getting less complex and robot-assisted which allows doctors to perform many types of complex techniques with more precision, flexibility and control than is possible with conventional techniques. Painful hip joint because of arthritis, fractures, injuries or bone tumor is replaced surgically with a robotic hip joint replacement. This artificial joint is made up of metal or plastic components. Robotic hip surgeries are usually more costly than the conventional one’s but Mako Robotic Hip Replacement in India facilitates your surgical approach of choice and its benefits are accessible to a wide range of population. Da Vinci robotic hip surgery is a minimally invasive surgical option for complex hip pain treatment procedures in India. In the minimally-invasive approach, doctors make one to two cuts from 2 to 5 inches long but the standard procedure is followed. However the small cut reduces blood loss, shorten hospital stays, reduce scar appearance and speed healing. In Certain types of joint replacement surgeries, robots can help to improve accuracy which leads to better outcomes for patients. What are the Preparations for Hip Replacement Surgery? If you have been advised to undergo hip replacement surgery, you must do a lot of preparations prior to this procedure. It is very important that you are in good physical condition before the operation. Your upper body will need all the strength it can get during and especially after this. A date will be scheduled for your surgery. Several things are necessary to prepare for surgery. For example, your surgeon might ask you to have a physical examination by your primary care physician. This will help to ensure if you have any other health problems, such as diabetes or high blood pressure, will be identified and treated before your important surgery. What type of Anaesthesia or Sedation is used for Hip Replacement Surgery? Before your operation, you will receive a general anaesthetic (where you are put to sleep) or a spinal (epidural) anaesthetic plus sedation, so you do not have to lie awake and listen to the operation. What is the procedure for Hip Replacement Surgery? Once you have been anaesthetised, the surgeon removes the existing hip joint completely. The upper part of the femur (thigh bone) is removed and the natural socket for the head of the femur is hollowed out. A plastic or ceramic socket is fitted into the hollow in the pelvis. A short, angled metal shaft with a smooth ball on its upper end (to fit into the socket) is placed into the hollow of the thigh bone. The plastic cup and the artificial bone head may be pressed into place or fixed with acrylic cement. Hip replacement comprises a combination of materials. These generally include cobalt chrome which is a very high-strength hard alloy that is usually used in places where the components are moving one relative to the other. The other metal commonly used is titanium. This is either in a commercially pure form or as an alloy with aluminium and vanadium. The third material utilized in hip replacement arthroplasty is usually ultra high molecular weight polyethylene plastic. Recent improvements, both in the type of plastic used as well as in the processing of the plastic, should result in a reduction in the wear of component inserted currently with those that were inserted 5 to 10 years ago. Effective Treatment: Hip replacement has proved as the most effective treatment for osteoarthritis for countless patients throughout the world. Reduce hip pain: Following the initial surgery-related discomfort (which will disappear within a few weeks), you should expect that your hip pain will either be eliminated or significantly reduced. Restore lost mobility: As your hip pain subsides, your legs will become stronger with increased use. That means better mobility, less fatigue and easier movements. Reliable Surgery: The hip replacement operation is one of the most reliable and well-tested operations in orthopaedic surgery and a consistent outcome is that it reduces or eliminates the pain of the arthritis in patients. Improve your overall quality of life: With less pain and greater mobility, you should be able to perform daily tasks more easily and lead a more active, more independent life. High rate of Patient satisfaction: High rate of patient satisfaction associated with hip replacement has made this surgery quite popular among surgeons hospitals and patients. Urinary problems and the need for urinary catheter. What are the post surgery precautions for Hip Replacement Surgery? The positioning of your hip is very important after hip replacement surgery. Make sure the hip never flexes more than 90 degrees. This is most likely to happen when the patient in bed, in a chair or a wheelchair, or on a commode. Always keep the operative leg in the neutral position, toes pointing up. You should not sit straight up in bed or bring the operative leg up towards your chest. Do not rotate your operative leg inwards. In the car, lead with the unaffected leg when getting in and out of a car. In the bathroom take a shower instead of a bath. Never bend over, lift heavy objects, kneel, or sit on low chairs. Any of these movements can cause a dislocation. Use a long-handled "reacher" to turn on lights or grab things that are beyond arm's length. Work with a physical therapist or other health care professionals to rehabilitate your hip. These precautions are necessary to prevent dislocation of the operative hip. Your routine activities will be modified to maintain the operative hip in a good position, and these changes will be addressed by your therapist. Continue your hip precautions for the first six weeks after surgery. Usually, people do not spend more than 3 to 5 days in the hospital after hip replacement surgery. After surgery, you will feel pain in your hip. Pain medication will be given to make you as comfortable as possible.Full recovery from the surgery takes about 3 to 6 months, depending on the type of surgery, your overall health and the success of your rehabilitation. You are able to walk on level surfaces for at least a distance of 100+ feet and climb stairs. What Types of Exercise Are Most Suitable for Someone With a Hip Replacement Surgery? Proper exercise can reduce joint pain and stiffness and increase flexibility and muscle strength. People who have an artificial hip should talk to their doctor or physical therapist about developing an appropriate exercise program. Most exercise programs begin with safe range-of-motion activities and muscle strengthening exercises. The doctor or therapist will decide when the patient can move on to more demanding activities. Many doctors recommend avoiding high-impact activities, such as basketball, jogging, and tennis. These activities can damage the new hip or cause loosening of its parts. Some recommended exercises are cross-country skiing, swimming, walking, and stationary bicycling. These exercises can increase muscle strength and cardiovascular fitness without injuring the new hip. What are the alternatives to Hip Replacement Surgery? While hip replacement can be helpful under the right circumstances, you should only consider it after a discussion of the risks, benefits, and alternatives with a healthcare provider. People with inflammatory arthritis (such as rheumatoid arthritis) may benefit from a treatment regimen of antirheumatic or other medications. Surgical alternatives — There are a few surgical alternatives to hip replacement. Surgical alternatives to hip replacement, such as hip fusion or osteotomy, may be considered in people who are young, in whom a hip replacement may not be durable enough to last for many years and/or withstand an active lifestyle. Why should you travel abroad to India for Total Hip Replacement Surgery (THR)? There are three distinct reasons that make India the most favoured and preferred destination for Orthopaedic surgery operative treatment procedures, India’s medical expertise, state-of-the-art technology at par with the best in the world, and the incredible cost-effective health care. Hip Replacement in India helps patient in their Orthopaedics related treatments by packaging their medical trip to India and it also offers a full complement of surgical as well as physiotherapy services exclusively to International Patients combined with their post - discharge recuperative holidays. In our medical network, we have more than 50 TOP hospitals for Hip Replacement Surgery in 15+ major cities across India with Expert Hip Replacement Surgeons at affordable price. A few months ago, I had my hip replacement surgery in India by a renowned ortho specialist from the Tour2India4Health Group. I was battling with my own fear and uncertainties for getting the operation done in a distant country. It was just a few phone calls and exchange of mails with them that made me come to India and mainly because the costing was almost half than what quoted to me in my home country. But the team of doctors and nurses connected to this group made everything seem so easy and I was actually able to stay focused on my surgery and was also able to deal with this surgery conveniently. India is the most preferable destination for patients who are looking for low cost hip replacement surgery. The cost of the Hip Replacement Surgery in India is typically a fraction of the cost for the same procedure and care in the US and other developed countries. The cost can vary depending on type of surgery, use of implant and other medical conditions of a patient. The costs of the Hip Replacement Surgery based on the type of surgery required in various countries in the chart / table are given below. The price comparison is given in USD. *The price for the Hip Replacement Surgery is an average collected from the 15 best corporate hospitals and 10 Top Orthopedic surgeons of India. How to get Low Cost Hip Replacement Surgery in India? We have worked out special packages of the Hip Replacement Surgery for our Indian and International patients. You can send us your medical reports to avail the benefits of these special packages. You would be provided with 3 TOP RECOMMENDED SURGEONS / HOSPITALS FOR YOUR HIP REPLACEMENT SURGERY in India. How many International Hip Replacement Surgery patients came to India? 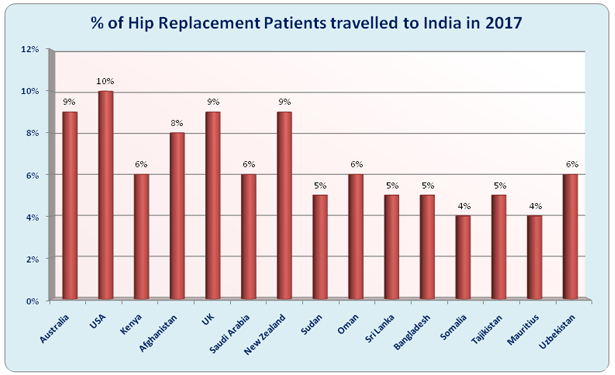 The list of TOP 15 countries from where the Hip Replacement Surgery patients travelling to India is given below. The major reason of large number of patients travelling to India for hip replacement treatment from these countries is because of availability of top hip replacement surgery hospitals in India, affordable prices strategic connectivity, food, zero language barrier and many other reasons. The maximum number of patients for Hip Replacement Surgery come from – USA, Australia, New Zealand, UK, Afghanistan, Oman, Uzbekistan, Tajikistan, Kenya, Somalia, Sri Lanka, Bangladesh, Mauritius, Saudi Arabia, Sudan. Here are the approximate percentage wise distributions of the patients coming from Top 15 countries to India in 2017 for Hip Replacement Surgery. ARE YOU ALSO A PATIENT WANTING TO TRAVEL TO INDIA FOR HIP REPLACEMENT SURGERY? Our International Patient Executive would connect with you and answer all that you need to plan your Hip Replacement Surgery in India. Why plan Knee Replacement Surgery in India with Tour2india4health Group? Tour2india4health Group is one of the leading medical value provider companies in India providing knee replacement surgery in India. You just have to send us a query regarding knee replacement surgery and within 24 hours an assistant will contact you for further details and interaction. From that point everything will be taken care of by that assistant, like arranging VISA, accommodation, appointment with the doctor with round the clock services to make your medical tour hassle free. We provide well qualified and professional doctors, surgeons, physicians, and medical staff who aid you in recovery from your ailment and ensure a safe and healthy journey back home. How long will my Hip implant survive? Hip Replacements are healthy options but not as reliable as your real hips. However, abiding by doctor’s advice and right exercise can give enough longevity to the implants, to over 15 years. I am diabetic. Can I have the Hip Replacement operation? Diabetes may trigger reaction to certain drugs given during Hip Replacement Surgery and need more attention. With the risks involved, consult our healthcare team to know more about the chances. When can the patient stand up after a Hip Replacement? Take it easy for the first few days, but its good to revive some activities to offset anesthesia and avoid blood clotting. Your physical therapist and surgeon feel will guide you to a new routine to get you habituated with new physical aspects. Yes. You will need a walker, a cane or crutches until your muscle strength returns after surgery. Your equipment needs will be determined by the physical therapist. It is better to keep your operated leg in neutral position after Hip Replacement Surgery for long term Benefits. Try sleeping on your back. Ask our medical expert about your peculiar condition if you can’t sleep in the same position all night.